Styles By Sheba: Check out the Back To Life team in Se7en Magazine! Check out the Back To Life team in Se7en Magazine! 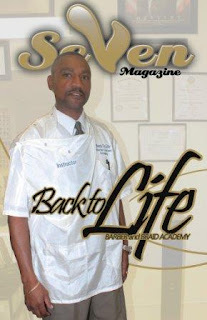 The Back To Life Barbers, Braiders, and Stylists were featured in the June issue of "Se7en" magazine. The photo shoot was done on Tuesday, May 17, 2011 at the Tidewater Drive location, featuring the team of 10, who work at 4 locations throughout Norfolk and Chesapeake. Se7en Magazine features small businesses throughout Hampton Roads ranging from barbers/stylists to restaurants to musicians.